A demonstrator is a very polarizing type of fountain pen amongst enthusiasts. Some love them for the ability to see the inner workings of the piston mechanism. Nothing is left to the imagination and new shades of ink can effect a chameleonic transformation upon the pen’s appearance. Others hate them for the very same reason since every errant blob of ink may become glaringly evident and stains aren’t so well hidden. Pelikan has released many demonstrators over the course of its history including several amongst their Classic series. This is Pelikan’s lower tier line with a somewhat less ostentatious trim than the Souverän series, stainless steel nibs in place of gold ones, and a slightly less polished finish. Don’t let those differences fool you though as these are excellent fountain pens for substantially less money than what the Souverän line commands. One production theme that has often been repeated across the M2xx series is that of the brown transparent demonstrator. 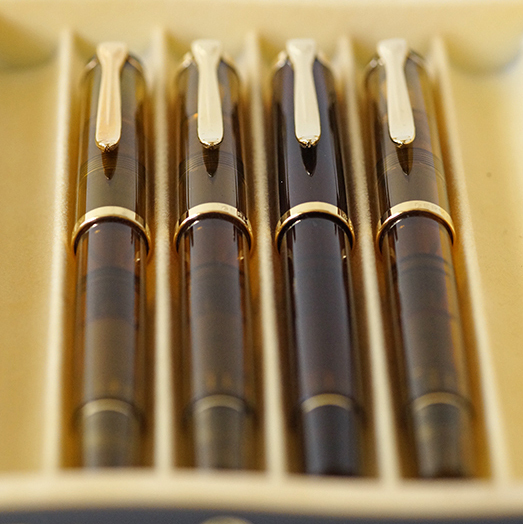 Since 2003, Pelikan has released four models done in a shade of brown, three of which are so similar that only a few tell tale details set them apart. The newest model to that line is several shades darker and I thought that it would be interesting to see these four distinct but related releases together so that you might see just how they stack up with one another and how much darker the Smoky Quartz actually is. 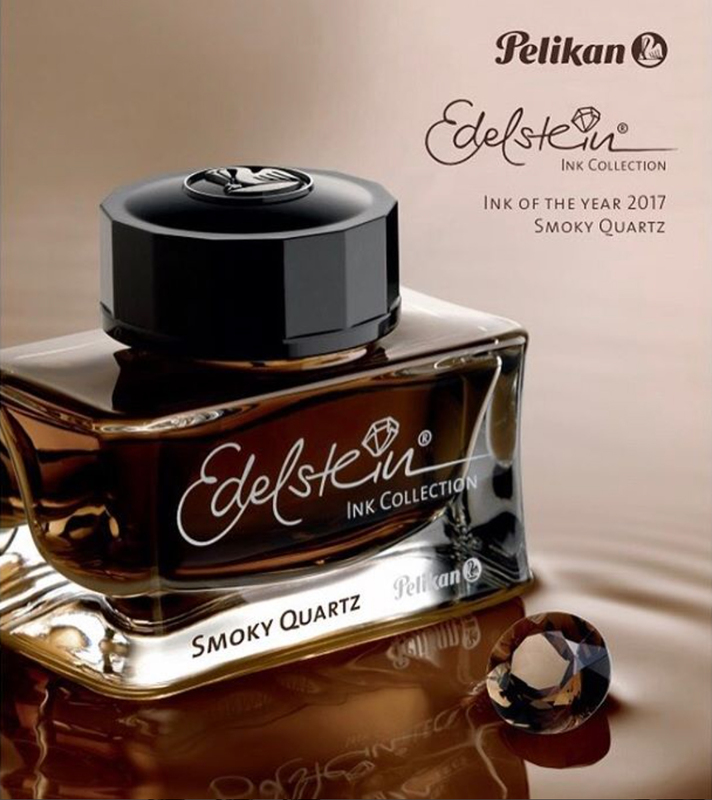 While not officially rumored, an announcement has been expected from Pelikan regarding a new fountain pen from their Classic line in the same color as this year’s Edelstein Ink of the Year, Smoky Quartz. This model would follow a pattern established by two prior releases emulating a limited edition Edelstein ink, Amethyst (2015) and Aquamarine (2016). Of note, both of those models were designated as part of the M205 line which is characterized by chromium plated furniture which is silver in color. Fritz-Schimpf, an awesome retailer based out of Germany, has given us our first look at the much anticipated Smoky Quartz demonstrator. While the release has been expected, I did not anticipate that it would be part of the M200 line-up, distinguished by its gold-plated furniture. It shouldn’t take long now for this pen to show up for pre-order via your preferred retailer. 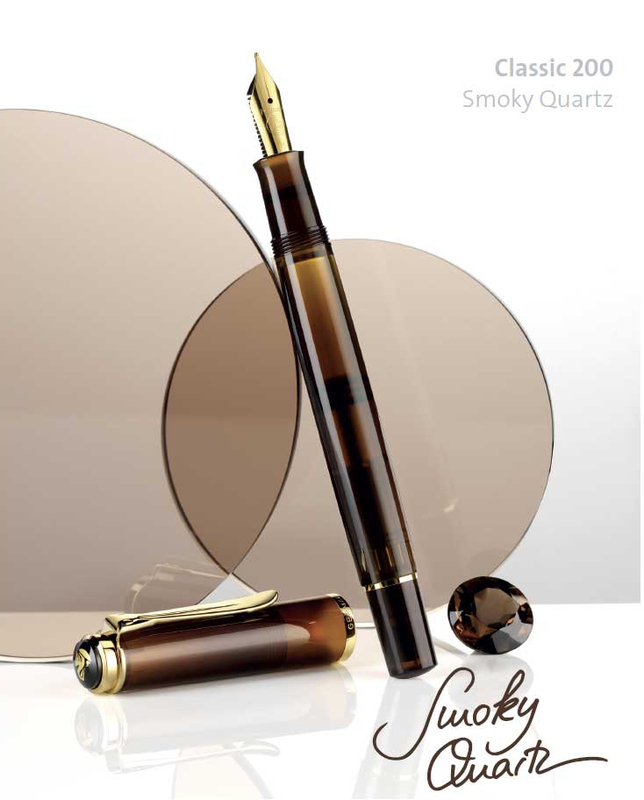 Consistent with past timelines, expect the M200 Smoky Quartz to be available sometime in August. Çelik Kalem, a major distributor for Pelikan pens in Turkey, follows up their announcement of the M101N Bright Red from yesterday with news of yet another upcoming release. Instead of a pen, their Instagram feed gives us our first glimpse of the Edelstein 2017 Ink of the Year, Smoky Quartz. This newest gem stone inspired color will follow on the heels of the very popular Aquamarine from last year’s limited edition run. It will be the fourteenth addition to the Edelstein line-up and the sixth Ink of the Year.